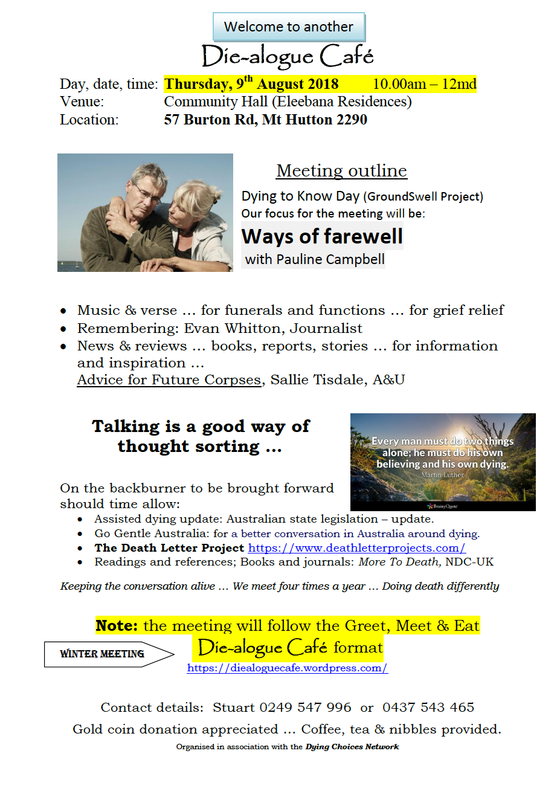 • Community members can learn about the value in planning for issues surrounding death and dying, it can be more positive and can even be fun. • We will help to generate ideas and conversations for your future & beyond. • Independent consultant to the funeral industry & grief counsellor - the importance of having a plan, why we have funerals & grieving. • What is on your 'Bucket List' conversations on how we can tick these off or add new ones! Event details: Digital Age Lawyers Katherine Hawes will walk you through the importance of writing a Will and the things you need to think about to keep yourself and your loved ones protected. She will also discuss the key legal matters that occur once a loved one has passed. Alongside Katherine will be Linda Campbell from Walking With You. Linda is an end of life doula or consultant. She provides support, options and education to assist the dying person, and their friends and family. With both ladies speaking at our event we will make sure that talking about death is made easier for you. Event details: MT & AT for teams & Residents using the resources in the kit to "start a conversation" & will have the Final Check List to distribute. Event details: Speakers include Health Professionals within the Hastings Macleay Clinical Network Palliative Care Service. Venue address: Palliative Care Unit Garden, Wauchope District Memorial Hospital, 69 High Street, Wauchope NSW. Event details: Round-table discussions hosted by Rest Easy Journal author Shanna Provost with guest speakers John Clarke, Lynda Ord, Robert Hewson and Stephanie Rattcliffe. This group of experts will talk about Advance Care Planning and how to make one; the importance of having a Will and Enduring Guardian; what you need to know about funeral planning; how to plan a loving memorial/funeral and understanding palliative care. 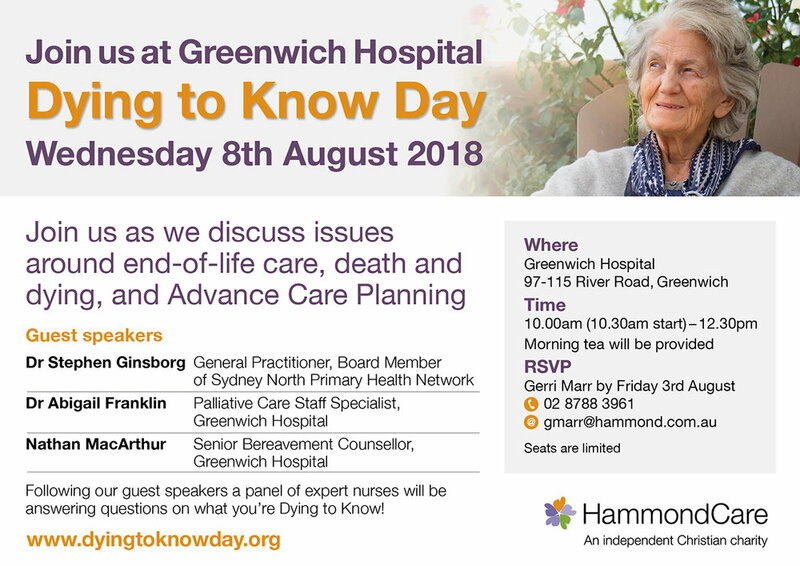 Event details: Silver Rainbow is hosting a Dying to Know Day event specifically for the older LGBTI community and their family. This event is completely free, with lunch and snacks provided. The day will be facilitated by Helen Callanan from End of life Doulas-Preparing the Way & Dr Annetta Mallon - Your End of Life Doula. Talking about death & dying is a surprisingly positive and enriching experience! It's not what most people would picture. We want to help people take more control and action on end of life planning and end of life care. Often conversations about death and dying are left a little late in life, talking about it now can help enrich our end of life experience and understand fully all the options available to us. This may include dying at home rather than hospital or having community led funerals. Community services workers and family or friends who are supporting older LGBTI people are very warmly welcome to join us. Event details: Once we receive the resources that have been ordered, we will have a better idea of how the morning will proceed. We weren't planning on having speakers. We are hoping that the topics will come from the participants and that the participants will share their knowledge on those topics.. Event name: Talking about dying never killed anyone...ever! Event details: A free morning tea for the community, guests are invited to write a postcard to the hospital about what is important to them in life that may be important at the end of life. Event details: Join us for a conversation with death advocate Jenny Briscoe-Hough, as we discuss death literacy; the role that everyone has in end-of-life care & death care & consider the practical and emotional issues that can arise. Venue address: City Library, Corner Cygnet & College Avenue, Shellharbour City Centre. Event name: Plan Your End Of Life & Live Better! Event details: Dr Annetta Mallon, thanatologist and End Of Life Doula, hosts an information evening for Central Coast NSW residents. Learn how advance planning for your End Of Life wishes - from choosing your executor to programming your funeral playlist - will free up time and energy to live your life to the fullest. In addition, consumer rights about funerals, memorial projects, and after-death care will be explored, meaning fun for young and old alike! Event details: Palliative care staff from Port Macquarie Base Hospital and community health team will be on hand at Settlement city Shopping Centre - adjacent to Gloria Jeans coffee shop - to have a chat - discuss issues of concern - start the discussion on Dying - what do you need to know? • Cemetery stories & more. Venue address: To be confirmed this weekend! Event details: The discussion will be on issues around end of life care, death and dying, and Advance Care Planning. 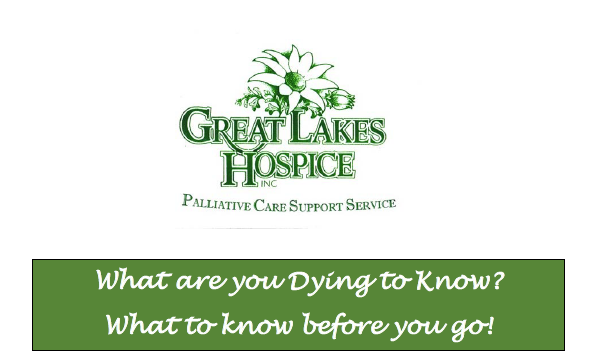 The speakers will be followed by a panel of expert nurses who will be answering questions on what you're Dying to Know! Event details: See flyer above for details. Event time: 3.15p.m. for 3.30 p..m. to 5.30 p.m. Event details: Let's just talk and share Q & A about "Dying to Know", which may include legals, wills, death certificate and registration. There may be other questions about Ceremonies, rituals, celebrations and grief. Come along and join in the discussion. Event details: What are you Dying to Know? What to know before you go ! 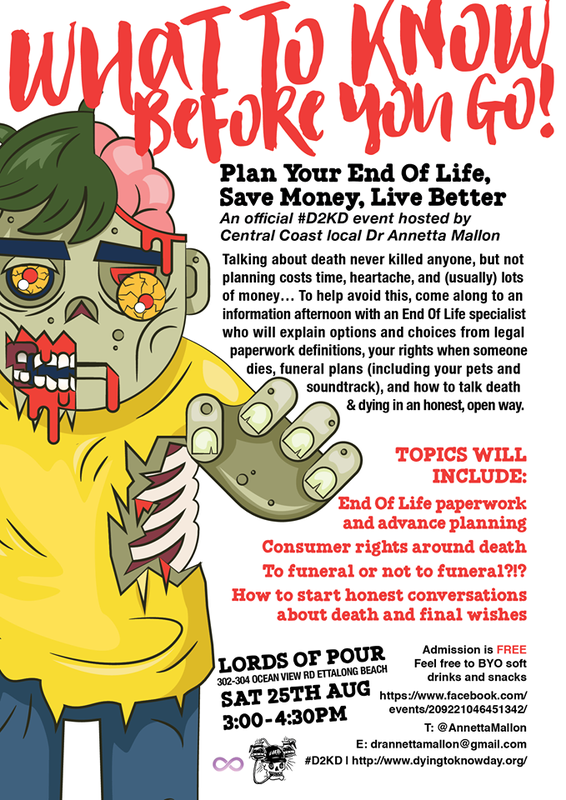 Event name: Plan Your End Of Life, Save Money, Live Better! Event details: A free information event specifically tailored for young people and young families, the Lords of Pour Cafe have donated the venue space so residents of the Ettalong Beach communities can become better informed about end of life paperwork, how to have conversations about final wishes, and how to save money on funerals and memorial services. Hosted by Dr Annetta Mallon who is an End Of Life Doula, thanatologist and consumer awareness advocate this #D2KD event is open to all who would like to better understand their options, choices, and rights under NSW law when it comes to death and dying. Ideas and examples will also be presented for having open, honest conversations about death wishes, advance health care plans, and funeral planning. As the event venue is generously donated by Lords of Pour attendees are invited to BYO soft drinks and snacks. Event details: Speaker : Caroline Minnear a young local woodworker who has made bespoke coffins for her loved ones. Annette Tesoriero and Larraine Franklin will guide discussion around how to start the conversation about death and dying. Conversation tools will be used and resources handed out. Afternoon tea will be served! Event details: 18 workshops , speakers and presenters on the subject of Death and Dying. From art, to the doctor who launched Advance Life Care Plan online (Merran Cooper), Peter Saul on 'Why is it so hard to die in the 21st Century , Creating your own funeral, How to make a coffin , DIY Funerals, Poetry, Life Story Writing, The Death Letter Project , The Threshold Choir and more. Event details: Death Cafe - Have a cuppa cake and chat with an End of Life Doula, Funeral Director,Solicitor and Priest at St Matthews Rectory . This is a free event to start off the conversation about death and dying.